Nothing quite so typlifies Philadelphia as the Mummers. 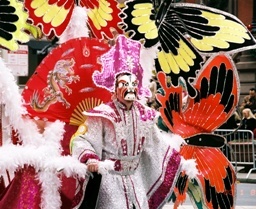 Unique to Philly, the Mummers are best observed on New Years Day at the legendary Mummer's Parade. Mummery is an ancient tradition, tracable back through such cultures as the Pharoh's Egypt and pagan Greece and Rome. The concept of dressing up and celebrating holidays is an interesting cross-cultural tradition. 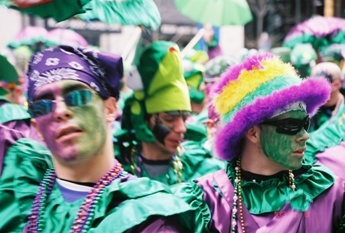 17th century immigrants to Philadelphia brought these traditions, and mummers have been part of the city ever since. Modern Mummers are divided into three categories: Comic, Fancy and String Band. Comic costumes can run from the sublime to the truly rediculous, often as a parody on some current event. Fancy costumes are usually very elaborate and ornate. The String Bands perform with stringed instruments such as banjos, and also include instruments such as accordians and saxaphones. The Mummers perform at various events during the year, but the most important is the annual New Year's Day parade. The parade starts in South Philadelphia and struts up Broad Street ending at a judging area adjacent to City Hall. 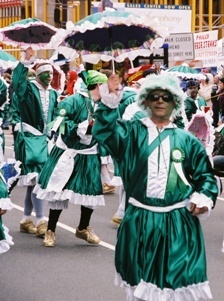 The Mummers march almost every year, but the parade has been posponed on occasion due to inclement weather. When postponed, the parade is usually rescheduled for the next Saturday. 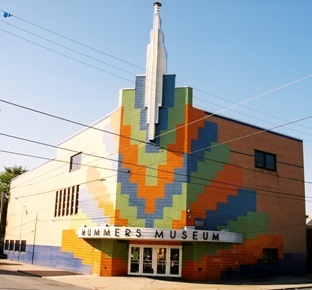 The Mummer's Museum was opened in 1976 and is "Dedicated to the Philadelphia celebration of New Years. The Museum houses a rich collection of Mummer's paraphernalia and memorabilia, from which the museum draws, to demonstrate the tradition of Philadelphia Mummery." The museum is located at 1100 South 2nd Street.